If you’ve ever had a toothache, you know how excruciating it is. You don’t have to be eating or drinking to feel the pain, either. Rather, there’s a constant hurt that feels like the universe is punishing you for every second you failed to brush your teeth long enough or forgot to floss. That’s awful enough, but what about your pets? 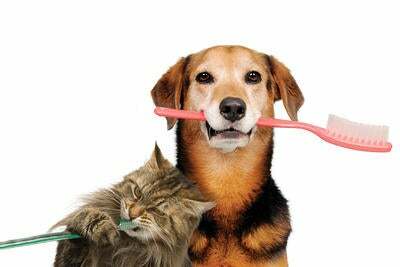 Many of us weren’t raised with the idea that other animals need to keep their teeth clean too, especially our domesticated companions. We might find out about their dental hygiene the first time we take our dog in for teeth cleaning or when our cat yawns and the odor stops us in our tracks. If we don’t take care of our pets’ teeth, they’ll experience toothaches and worse, but it will be our fault. Dental hygiene is as much about preventing unnecessary pain as it is preserving health, and below you can find tips for keeping your pets’ chompers in good shape! Of the pets commonly kept in the United States, dogs are probably the easiest to care for in terms of dental health. You can buy toothbrushes and specially-formulated toothpaste for them at almost any pet store or vet clinics. Most veterinary offices offer dental cleaning services, not to mention treatments for common ailments and even oral surgery. Basic care requires daily tooth brushing and yearly dental cleanings, which can be done with or without anesthesia, depending on your dog’s health and needs. It might be challenging at first to brush your dog’s teeth, but they will eventually adjust especially if you start them young. Animal Planet suggests letting your dog get acquainted with the tools you’ll use by sniffing them out and gradual exposure to having their muzzle handled. It also helps to choose a toothpaste flavor your pup will drool over (may we suggest peanut butter flavor?). Patience and consistency will give you and your four-legged friend the best results. Other measures you might take to improve your dog’s dental health include dental chews, that are sold in most pet stores and in our office. Be sure to read the ingredients to check for allergens and fillers, though! Adult cats might not be as accepting to having you hold their chin and brush their teeth, but both kittens and cats can adjust to it as well. As with dogs, cats need daily tooth brushing for optimal health, along with an annual dental exam to address issues that may need preventative action or that may have arisen but gone unnoticed. You will be able to find toothbrushes and toothpaste made specially for cats fairly easily if you visit a pet store or shop online. You should never use toothpaste made for humans on a pet, but especially not on a cat as they may become seriously ill. Luckily, there are numerous toys made for cats that can entertain them while also contributing to dental health. Some examples include the Cat Dental Mint Stick and Catnip Plaque Away Pretzel by Petstages! Providing proper dental care isn’t just imperative for pet guardians with dogs and cats, but also for those with rabbits and rodents! These smaller companions have incisors that never stop growing, and so their diet absolutely must be species appropriate to avoid health consequences. If you get a pet rabbit or rodent, or already have one but never arranged an examination that included dental, bring them in to NOVA Pets at your earliest convenience to ensure their teeth are currently healthy and to find out what you can do to keep them that way! If you have reptiles or exotics, the kind of dental care needed will depend on the pet’s species. Bearded dragons and ferrets, for instance, need to have annual cleanings just like dogs! To find out the most appropriate care plan for your pet, bring them in for a comprehensive health examination. NOVA Pets offers Wellness Plans for dogs and cats that include dental care and can also provide dental services for other pets, including exotics! Schedule an appointment today by calling (703) 378-9791.